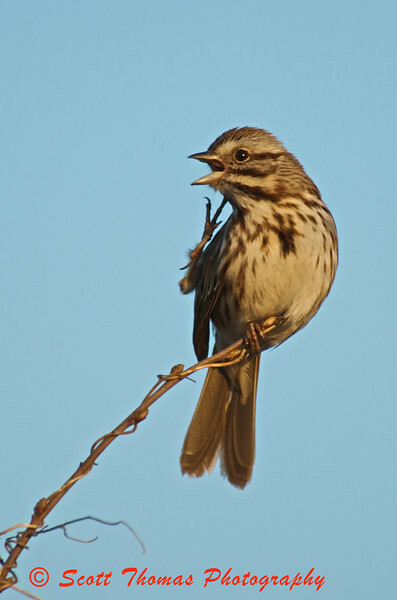 Song Sparrow scratching an itch on his perch in the Montezuma National Wildlife Refuge. This entry was posted in Animals, Nature and tagged birds, itch, montezuma, new york, Photography, scratch, song sparrow, wildlife, wildlife refuge. Bookmark the permalink. Not your typical bird photo. I like it, did you use flash? No flash as I wanted to keep the golden light of the morning’s Sun. I did use flash in the afternoon which worked great to bring out the colors of these beautiful birds. Miss Sadie and the Cowboy can relate. Cheery little guy! – and I love the tendrils twining about his perch. Sure, Scott. You wouldn’t want to stop a good song just to scratch an itch would you? I agree with Gerry — I just love that vine! And the light is wonderful — beautiful picture! A wonderful Blog and beautiful photos Scott Thomas. Thanks for your visit to my Blog and your comment on your father loading the bombs on the aircraft, sounds very interesting. I’ll pop back from time to time and catch more of your great shots. Hi, Imac! Thank you for your comment and hope to see ya around. My Dad was at the same field featured in the movie, 12 o’clock High. I really like this shot. You can imagine the bird telling his buddy a story and stopping for a scratch in the middle of his story. Hey, did you submit this one to Shrew for storytelling? No, I submitted a different photo which will tell a very interesting story.